The initial public offer (IPO) of HDFC Asset Management Co. Ltd, India’s second largest fund house with assets of ₹ 3.06 trillion, is open from 25-27 July. The issue price on a ₹ 5 face value share is expected to be ₹ 1,095-1,100, to be decided through the book-building route. In November 2017, Reliance Nippon Life Asset Management Co. Ltd, the country’s fourth largest fund house with assets of ₹ 2.40 trillion, got listed. Its listing price was ₹ 294 on BSE Ltd; its shares closed at ₹ 218.45 on 23 July 2018. Industry insiders says a few other large asset managers may also get listed eventually. “Fund performance depends on market; AMCs have no control over market. The mutual funds business is a pure assets gathering game. Unlike a manufacturing company that can reduce its price, offer discounts, new products and so on, a fund house does not do all of that. It has to gather assets if it wants to make money," said Deepak Chhabria, CEO and director, Axiom Financial Services Ltd, a Bengaluru-based distributor of financial products. 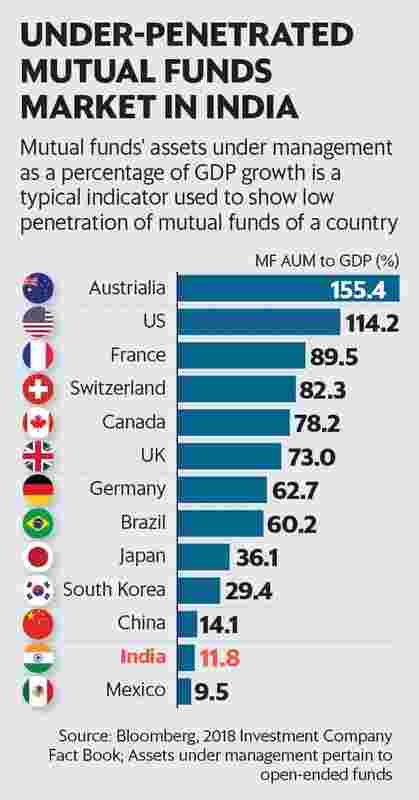 Although MFs have been in India since 1987 and private sector fund houses entered the space in 1993, they haven’t yet penetrated in the hinterlands of India . But there is room ahead for expansion. “The ‘financialisation’ of savings is going to be the biggest driving factor, fuelling the potential growth of the MF industry in India. With MF-to-GDP ratio in the country at just about 10% compared to about 50% in the UK and about 90% in the US, the opportunity for growth is large," said Nithin Sasikumar, co-founder and head-research, Investography Ltd, a wealth management firm. Can expenses come down further? Milind Barve, managing director, HDFC AMC, told Mint, on the sidelines of the press conference announcing the IPO, that he “does not expect expense ratios to come down in near future, after the February cuts". But no one can tell the future. “There is a fair chance of expense ratios to come down further over the next few years. As markets get mature, it would get tougher—though not impossible—for fund managers to outperform the benchmark index. They will find it difficult to justify higher expense ratios," said Shyam Sekhar, chief ideator and founder of iThought, a Chennai-based investment advisory firm. Then, there is competition. When Radhika Gupta joined Edelweiss Asset Management Co. Ltd as CEO, she took few key measures to boost the wearying fund house. Among them was cutting down the expense ratio of its large-cap fund, Edelweiss Large Cap Fund, to 1.3%. “When large-cap funds don’t offer significant alpha, what’s the point in charging so much fees? Today, our large-cap fund is one of the cheapest large-cap funds around," she said. Experts believe that fund houses with a large proportion of direct sales have a better brand and bigger pricing power when it comes to fixing commissions for distributors. Industry experts say that fund houses, especially large ones, have increased their focus on direct plans. They have also steadfastly increased their branch network. HDFC AMC Ltd’s red-herring prospectus said it has increased the number of branches to 210 as of 31 March 2018, up from 141 as of 31 March 2014. Barve said the branch network is not to increase direct sales, but “to service more distributors in smaller towns as they enter the MF business".